When it comes to smartphones on the cheap, Symbian is the most common OS with the occasional Windows Mobile sneaking in. Rumor has it that Gigabyte will try to wedge Android in there too with one of the cheapest Android devices yet. The cheapest Android right now is the HTC Tattoo for 210 euro (300 US dollars). The Android-running Gigabyte GSmart will be priced at less than 9000 rubles for the Russian market, which works out to less than 210 euro. Coincidentally, the specs of the HTC Tattoo and the Gigabyte GSmart are almost identical as well - 528MHz CPU, 256MB RAM/512MB ROM, 2.8" QVGA screen, Wi-Fi, GPS, Bluetooth, microSD and 3.5mm audio jack. The Tattoo however has the upper hand - the Gigabyte GSmart Android phone reportedly only has two-band GSM/EDGE, versus the Tattoo's quad-band GSM/EDGE and two-band 3G with 7.2Mbps HSDPA. 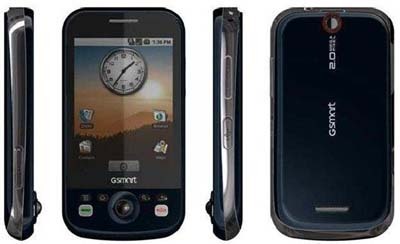 It also has a 3MP auto-focus camera, while the camera on the new Gigabyte GSmart is just 2MP with auto-focus. Both phones run Android v1.6, but while the Tattoo has HTC's Sense UI, the Android on the GSmart looks vanilla. The physical dimensions for the Gigabyte's first Android phone are 103 x 54 x 13.4 mm and it's powered by a 1500mAh battery. The Gigabyte GSmart with Android is expected to come out in February. The price is said to be lower than 210 euro, but if it's not much lower, than the GSmart faces a tough competition from the Tattoo (and upcoming HTC's) - HTC is well established in the Android world.